Yet another style that I tried to pull off. Dolled up in casual sporty look for a casual weekday. This is my another first time wearing a beanie here on Brown Platform and I don't know whether I suit this kind of style or not because I was only having fun in matching these two items I got from Dignity. Your tights are so pretty! Your hair looks amazing in this! You definitely pulled this look off. I think you should've worn some nice sneakers or sneaker wedges! gosh! 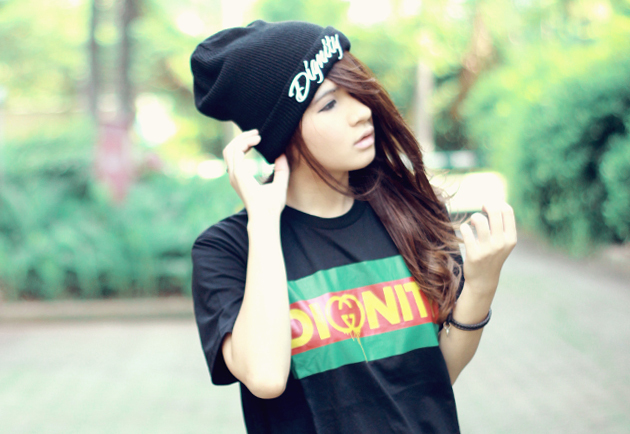 that beanie is sick! love it! it suits you really!!! you look great in everything you wear ci! so much cool! you mix it very well!! love this look!